7 June 2013 – A study visit to Bulgaria was organized from 2-6 June 2013 in the framework of the Project “Strengthening Mechanisms for Public Finances at Local Level in Montenegro”, implemented by the UNDP Office to Montenegro in partnership with the Ministry of the Interior, the Ministry of Finance and the Union of Municipalities of Montenegro. The Study visit on “Good Examples of Municipal Borrowing and Emitting Municipal Bonds in Bulgaria” was a forth organized visit within the project. It was continuation of a number of seminars focused at the improvement of capacities of municipal secretariats for finances by providing trainings, on-job trainings and exchange of knowledge peer to peer. Participants were introduced with the structure of municipal budgets in Bulgaria, their preparation and reporting, financing investment activities, absorption of funds from the EU Operational Programmes, credit’s instruments, functioning of the Local Self-Government Fund (FLAG) and providing assistance to municipalities, guaranties, and soon. 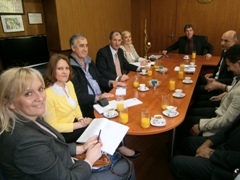 Montenegrin delegation was consisted of Mr. Luka Medenica, Municipality of Kolašin; Mr. Milovan Baždar, Municipality of Herceg Novi; Mrs. Slavica Terzić, Municipality of Pljevlja; Mr. Salih Šabović, Municipality of Plav; Mrs. Dženana Šćekić, UNDP Montenegro and Mrs. Žana Đukić, Union of Municipalities of Montenegro. Participants paid visits to following institutions: the National Association of Municipalities of the Republic of Bulgaria, the Local Self-Government Fund (FLAG), municipalities of Sofia, Svishtov, Belene, Stara Zagora and Gurkovo, and the Regional Information Centre in Stara Zagora. Representatives of these institutions warmly welcomed the Montenegrin delegation. They expressed their interest for cooperation and providing assistance to Montenegrin local authorities on the way to the European Union.